Unlike shopping for an engagement ring—when it’s often just one person making the decisions—most couples shop together for wedding bands. 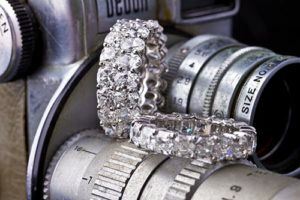 And in many instances, couples want their rings to “match”. But not only is this unnecessary, it’s sometimes difficult or simply impractical. For instance, a woman may have a platinum and diamond engagement ring, which frequently is paired with a coordinating band. If she or her fiancé wants to have matching rings, his options are limited to a platinum band or one set with one or more diamonds. Some men want the simplest, cheapest ring they can find because they’re not accustomed to wearing jewelry, and it quite simply doesn’t matter to them. But there are many others with definite ideas about the material and design of the ring—they want their ring to reflect not only their marriage but also their personal style. You also need to think about differences in skin tone with a men’s wedding band. A white metal ring may look beautiful on a woman’s hand, but the warmer tones of yellow or rose gold may look better on her fiance’s. Practicality is also a major consideration. For a man with a job or hobby where any jewelry needs to withstand extraordinary wear, it may simply not make sense to invest in a handcrafted precious metal ring. Although industrial metals have their own limitations, they are durable and inexpensive and do provide an alternative. For the majority of couples, what’s most important is that they both honor their commitment to each other by wearing a ring—the color, style, and material matter far less than the symbol. ← What Size Diamond Should I Get?